also known as The Show-Man, was an Indian film actor, producer and director of Hindi cinema. He was the winner of nine Filmfare Awards, while his films Awaara (1951) and Boot Polish (1954) were nominated for the Palme d'Or at the Cannes Film Festival. His performance in Awaara, was ranked one of the "Top-Ten Performances of all time", by the Time Magazine. The Government of India honoured him with the Padma Bhushan in 1971 and the Dadasaheb Phalke Award in 1987 for his contributions towards Indian cinema. 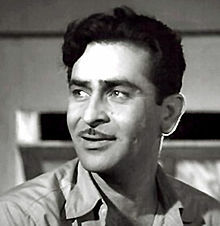 Raj Kapoor was born in Peshawar (Pakistan), British India (present day Pakistan), to a Hindu family of Prithviraj Kapoor and Ramsarni (Rama) Devi Kapoor (née Mehra). He was the eldest of six children in the family. He was the grandson of Dewan Basheshwarnath Kapoor and great-grandson of Dewan Keshavmal Kapoor, part of the famous Kapoor family. Two of Raj's brothers are actors Shashi Kapoor (a.k.a. Balbir Raj Kapoor) and the late Shammi Kapoor (aka Shamsher Raj Kapoor); the other two died in infancy. He also had a sister named Urmila Sial. The Kapoor family hailed from Peshawar and were Hindkowan but they were also landowners in the canal colony of Lyallpur, British India, which is now called Faisalabad in the Punjab province of present-day Pakistan where the family lived for a while. He was married to Krishna Kapoor, sister of actors, Rajendra Nath and Prem Nath.